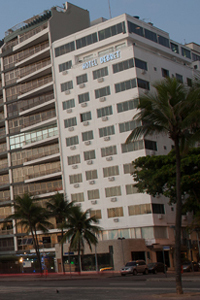 Located in one of most strategic point of Copacabana Beach, just a block from the subway, Royal Rio Palace Hotel offers to its guests an easy access to downtown, shopping centers and to the most fashionable places of Rio. When would you like to stay at Royal Rio Palace Hotel ? 1) Rates at the Royal Rio Palace Hotel may not be valid during Carnival, New Years, Easter and other special dates.